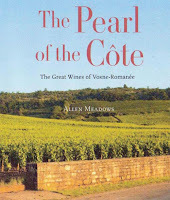 Allen Meadows, the famous Burghound, specialist of Burgundy wines, will soon publish a long-needed book on the The Pearl of the Côte. The Great Wines of Vosne-Romanée. As Allen explained in a recent interview on the newwineconsumer.com podcast, the idea of the book came to him when he was tasting 74 (yes, 74!) vintages of the greatest Burgundy wine, La Romanée-Conti. This very exceptional vertical tasting started him thinking about the best way to convey to his readers the secrets and beauty of those wines and terroirs. Of course, he’s going through the history of the wines and the terroirs. But more original, he put together exact maps of the terroirs, working from maps and archives of the French administration. This long and delicate work will bring a new knowledge of those difficult terroirs – so fragmented. Allen’s book will be available soon. If you’re as eager as I am to get your hands on a copy, sign up to be notified on its release. Next post: New name, new bottle, new label, new wine?